December 18, 2015 – Today, author Barry Strauss explores the political, military, and social motivations behind history’s most famous murder. Mr. Strauss is professor of history and classics at Cornell University, and a leading expert on ancient military history. Visit him @BarryStrauss on Twitter or at BarryStrauss.com. 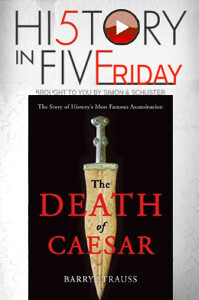 And don’t miss our full interview on his book, The Death of Caesar, when we upload it on December 21, 2015.